The good news is there are several options for disposing/recycling water based paint. Earth Paint Collection Systems acts as a central contact for latex paint recycling. They can assist with finding locations currently accepting Latex Paint throughout Lake County – Please call (847) 231-6044 for additional information. Or, as the last option, treat the latex paint for dispose through your regular garbage hauler. Take & Leave the lids off, pour clay cat litter, (or shredded paper, sand or sawdust) into the can, stir to the consistency of thick oatmeal (no longer in liquid form), leave the treated paint cans outside your garbage can on your regular garbage pickup day (please don’t exceed 3-4 cans per week). The added absorbent material helps bind the liquids together, reducing the possibility of the paint splattering not only in the truck, but the roads and the vehicles behind the hauler. 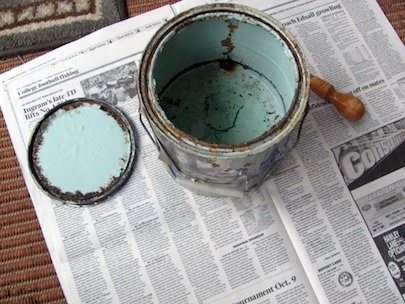 If you're dealing with completely empty paint cans (no residual liquid at all), simply remove the lids and leave out as described above. Another point worth mentioning: if the garbage hauler spots the cans with the lids still on, they may assume no attempts to solidify the paint were made and they may not take the paint cans. Focus on transparency! Thank you again for your dedication and efforts in keeping Lake County resources in check! Please call with any questions or comments - We're happy to help. To stop receiving ALL Lake County emails, unsubscribe here.